White rights enthusiast and former Neo-Nazi associate Sean Hannity has repeatedly made racial attacks on Barack Obama. But on last night’s (9/22/08) Hannity & Colmes, Hannity disingenuously stated, “The only people I’ve seen that are using race in this campaign, is Barack Obama who brings it up himself a lot and a lot of his surrogates.” Unfortunately, guest Al Sharpton let him get away with this outrageous falsehood. So we will refresh Hannity’s memory. With video. Yes, we can and we need look no further than Hannity’s fingers. Hannity, himself, has relentlessly tried to paint Obama as a racist from the beginning of the campaign. We have heard that Hannity is no longer a Republican (but a registered Conservative) but he has done fundraising for Rudolph Giuliani and was reported to have vetted the choice of Sarah Palin for the McCain campaign. And is there anyone who saw his lapdog sales pitch interview with Sarah Palin who can deem him not a partisan for Republicans? Even on a program which acknowledged Obama's criticisms of Farrakhan and the Million Man March, Hannity tried to cast Obama as a bigoted soulmate of Farrakhan's. Hannity overtly suggested that an Obama win could mean "a racist and an anti-Semite would be president of the United States." Hannity has stated, "I'd like (Obama) to (answer) a simple question: have you ever met with Louis Farrakhan? And if you did, I'd like to know the details of it. Why did you go to the Million Man March, knowing that this is a man who has referred to Judaism as a gutter religion and the white man as the skunk of the planet earth?" In fact, Hannity already knew that Obama had gone to the March as an observer and a Farrakhan critic (and he remained one afterward) because the issue had been covered previously on Hannity's America. As far back as March, 2007, before the Rev. Wright controversy, Hannity was trying to use Obama's religion to smear him as a black militant pagan. Unfortunately, guest Al Sharpton, who was so incensed by Don Imus’ “nappy-headed ho” comment that he demanded his resignation, continues to ignore Hannity’s far more blatant, far more pervasive and far more hostile bigotry. We have written Sharpton many times about it so it’s hard to believe he does not know. Yet for some reason, he fails to address this prime time racism that has been going on for years, even before Obama's campaign. Last night, as Hannity demanded of Sharpton, “Who in the Republican Party is bringing up race? ...Why does (Obama) keep saying that?” Hannity’s intent could not have been plainer: to accuse Obama of being a racist. This is a familiar tactic of Hannity's. Whenever the issue is race, Hannity is always at the ready accusing African Americans of being biased against whites. Yet he is equally eager to defend any white accused of racism. But Sharpton did not give back to Hannity what he was surely dishing out. I like Sharpton but it's hard to understand how anyone who calls himself a civil rights leader can give Hannity a pass on the subject. And, by the way, it’s not just Hannity. A look at the “racial issues” category of our blog shows that FOX News is an enthusiastic partner in playing the race card. 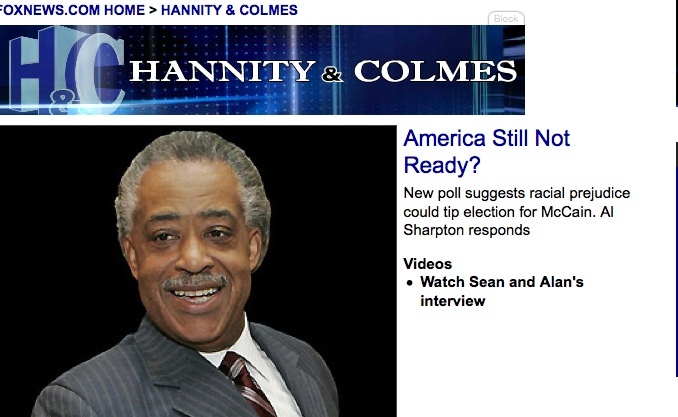 Even the Hannity & Colmes website is doing its part to promote racial divisiveness by saying, “America Still Not Ready? New poll suggests racial prejudice could tip election for McCain” (screen grab below). You can contact Hannity and let him know that not everyone has as short a memory as he does at hannity@foxnews.com. You can also contact Alan Colmes at colmes@foxnews.com and FOX News at feedback@foxnews.com. The portion with Hannity begins at the 3:52 mark in the video. It's worth noting that in the 6:32 segment Hannity gets significantly more time than Colmes.